I’m sure many of you are as tired of this blog as I am. The same old nature photos, natural history, prairie management/restoration information… It just drones on and on. Honestly, I don’t know how you manage to drag your eyes through most of my posts. How much prairie stuff can one person read about, after all? Well, the blog isn’t going away anytime soon (why, what have you heard??) But in an effort to keep it from growing stale, I’m introducing a new feature called “The Prairie Word of the Day.” …Yes, I know – a titillating title, isn’t it? It ought to be, it took me about three months to refine it. It’s pithy, catchy, and descriptive all at once. Or at least descriptive. 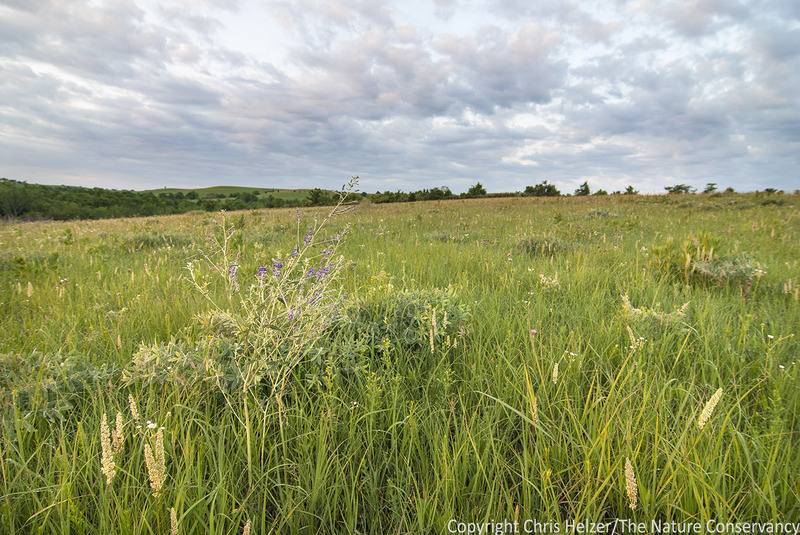 As with any field, prairie ecology is full of jargon; words that make sense to those of us who spend most of our waking hours thinking about prairies but make no sense to anyone else. I try hard not to use to much prairie jargon in my posts, but I slip up now and then. Sorry about that. There are a lot of fun, but confusing, prairie jargon words out there, so I thought I’d highlight one now and then and try to explain what it means. I would love to hear nominations from you as well – what undecipherable words do I or others use when talking or writing about prairies? However, if you are REALLY into prairies or botany, you might be familiar with a third definition; one that is related to grasses. Although it is used somewhat inconsistently, a tiller usually refers to the aboveground shoot of a grass. In other words, if you were to look closely at a grass plant you’d see that most of them have multiple stems at their base. Each of those stems is a tiller. 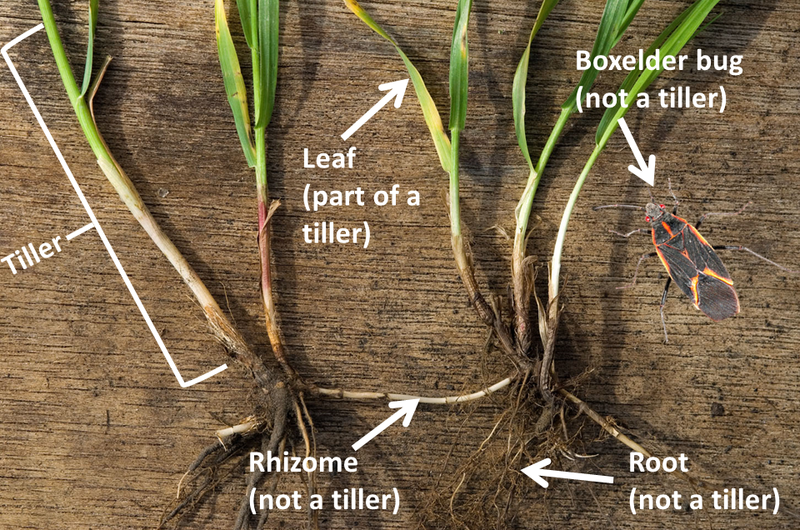 Usually, the term tiller only applies to shoots that emerge from buds at the base of other tillers, not from seeds. 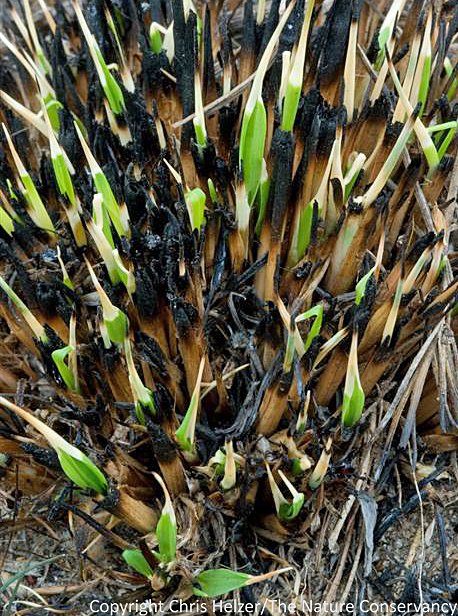 Thus, when a grass seed germinates and starts to grow, the first shoot that pops out of the ground is not a tiller. It’s just a shoot. I guess. But after that, every new shoot that comes out of the ground from that plant is a tiller. The tillers of this bunchgrass are all bunched together. There are numerous tillers in this sward. Too many to count – even for a graduate student. Well anyway, that concludes the first ever installment of The Prairie Word of the Day. I hope it was instructive. Please nominate terms (in the comments section below) you’d like to see included in future Word of the Day posts and I’ll try to use as many as I can.